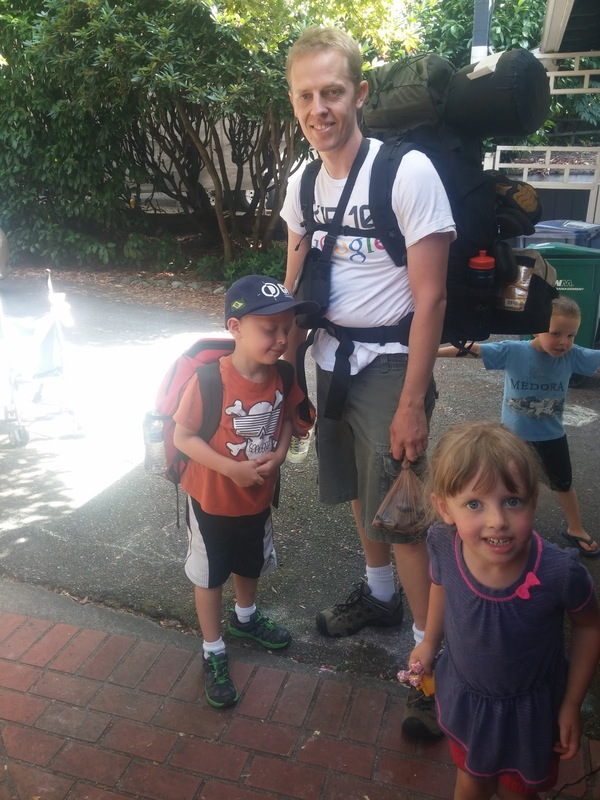 On August 26, Jared and Todd left for an overnight hike. We didn't tell Jared about it until the morning they were leaving, since he gets excited and can't sleep. He was beyond excited. He has been asking to go backpacking with Daddy for about two years. Todd and Jared went with Cambell and Grant to Barclay Lake for an adventure. 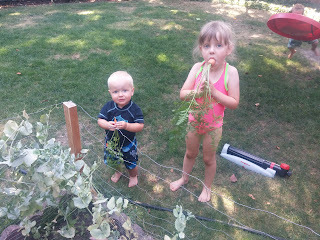 We stayed home and played in the sprinklers, then had pizza night with the rest of the Christensens. We also ate carrots right out of the garden, complete with dirt. They taste better that way, don't you know? 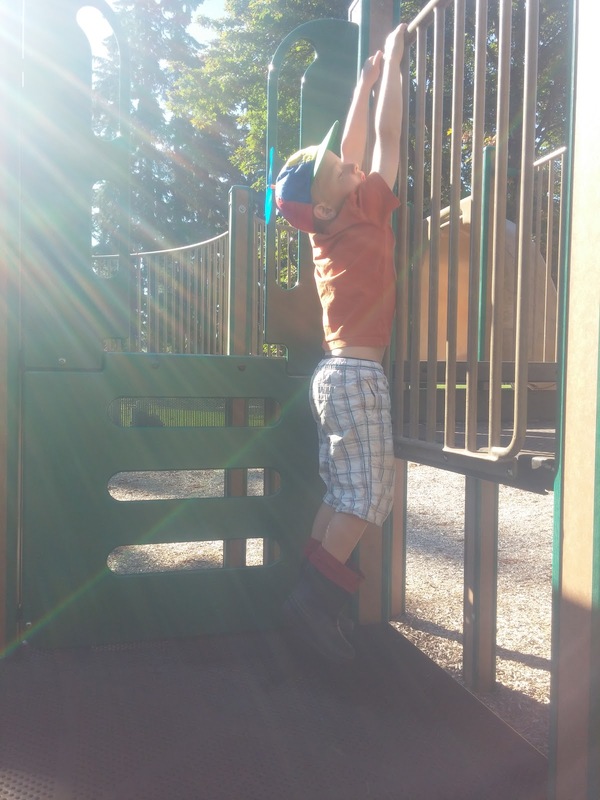 Sammy climbs ladders. He can actually climb up and down unassisted. 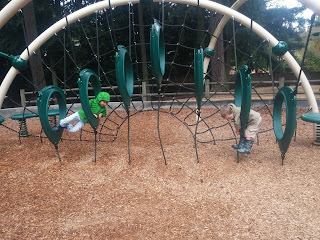 When I think of all of the time I spent spotting Jared and B on ladders, this makes me laugh. 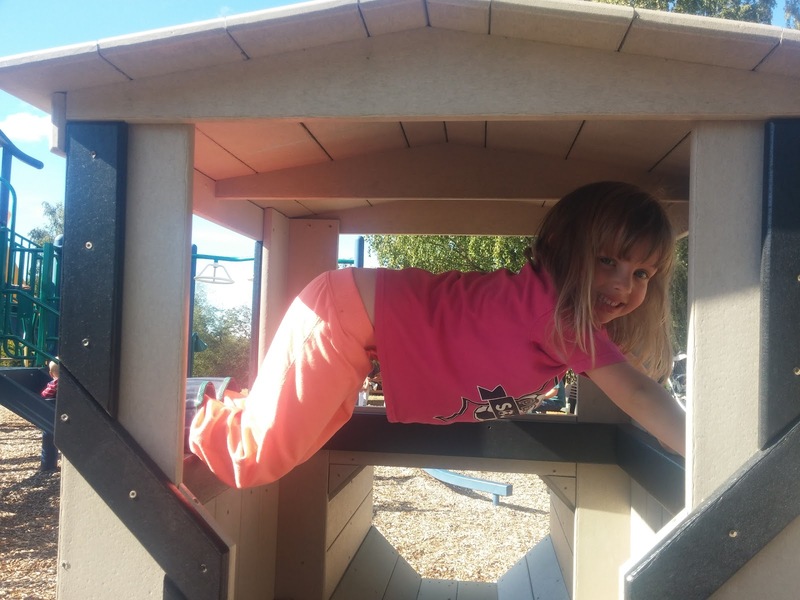 Eloise did not like to be spotted. I usually keep the ladders put away, since when I think about babies with broken bones, I usually am also thinking about bunk beds, but I've caught Sammy climbing up the windows of the playhouse bed, so the ladder might be safer. He loves his proximity to the ceiling here. 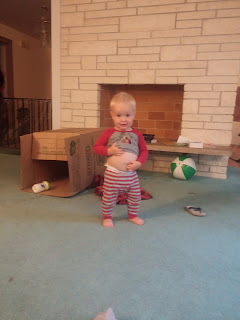 At Sammy's 18 month checkup, they asked me if he can identify two different body parts. 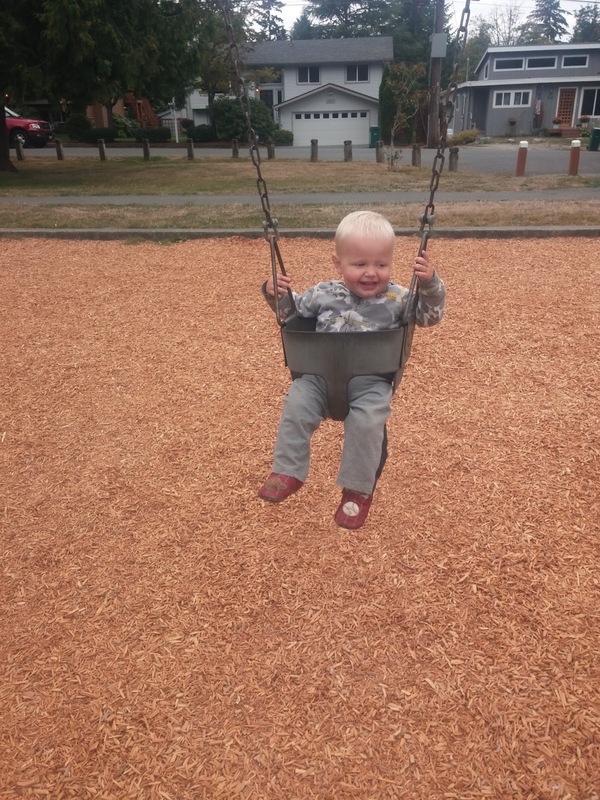 Yes, he can, but he has one favorite. He will show you his belly if you will show him yours. 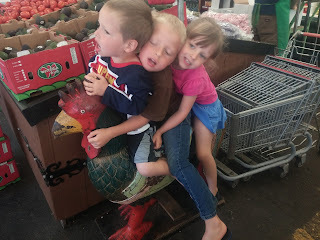 Summer means shopping at the market for local produce, and, of course, riding the rooster. I bought Jared these skinny jeans so that I could secretly laugh at him in them. 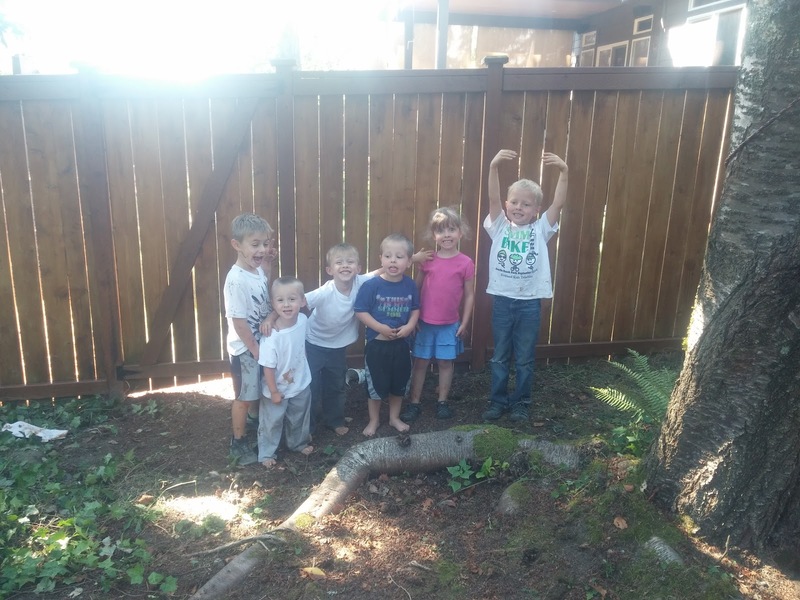 Now that I have a bunch of independent kids, I decided to tackle a home project all by myself. 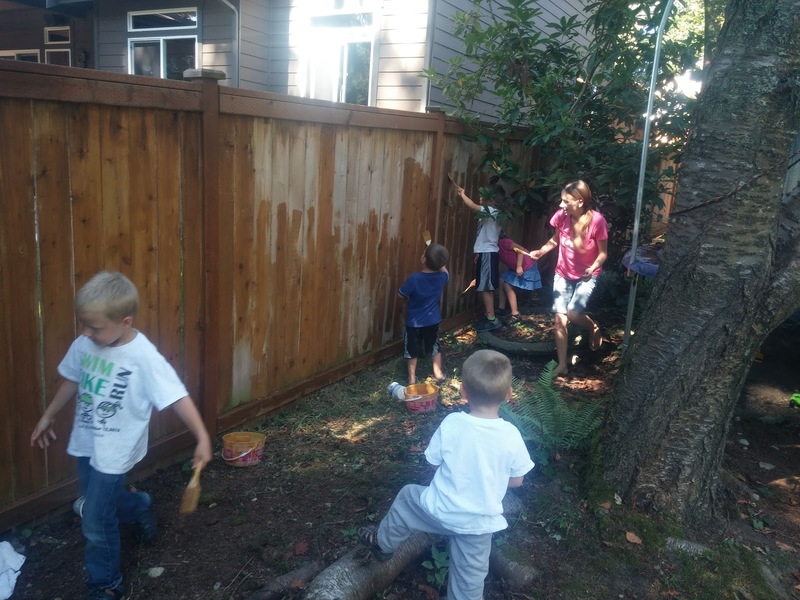 And by all by myself I mean that I recruited Rebecca and her boys to come and help me and all of my children stain this back fence. And then I hired a neighbor girl and roped the missionaries into helping with the second coat. But we got it done! Not a moment too soon, either. This was probably the last stretch of warm and dry weather we had for the year. I was really proud of Jared and Eloise. They painted like crazy for the whole two coats, putting in about four hours worth of work. 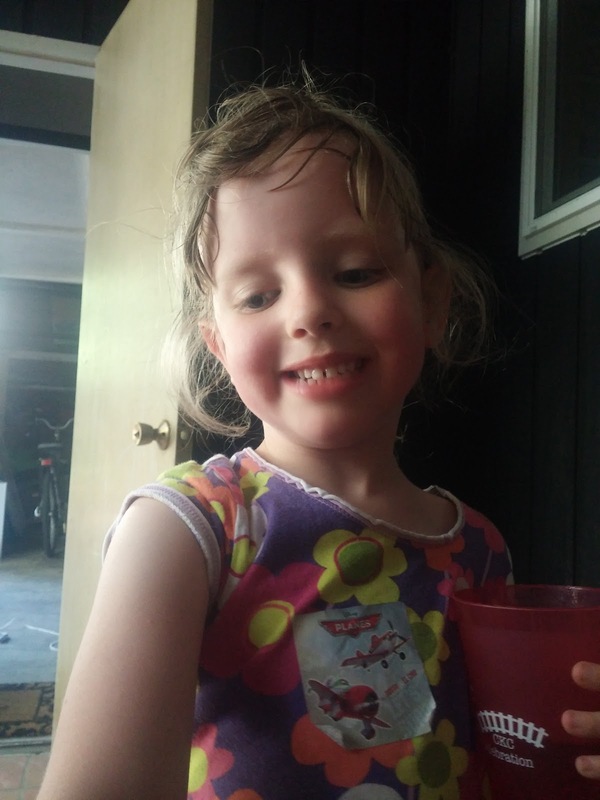 I just got the last of the stain out of Eloise's hair this morning from this messy job, but we did it! 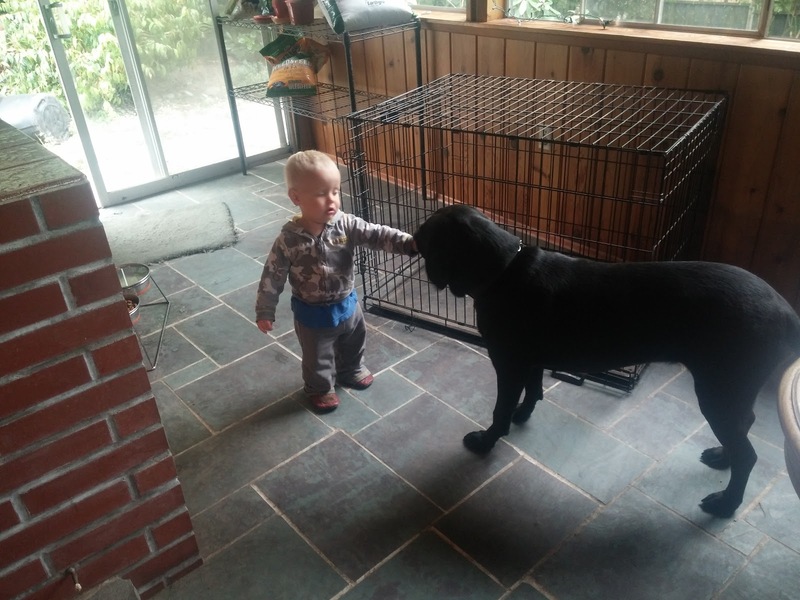 Sammy loves bossing Shadow around. 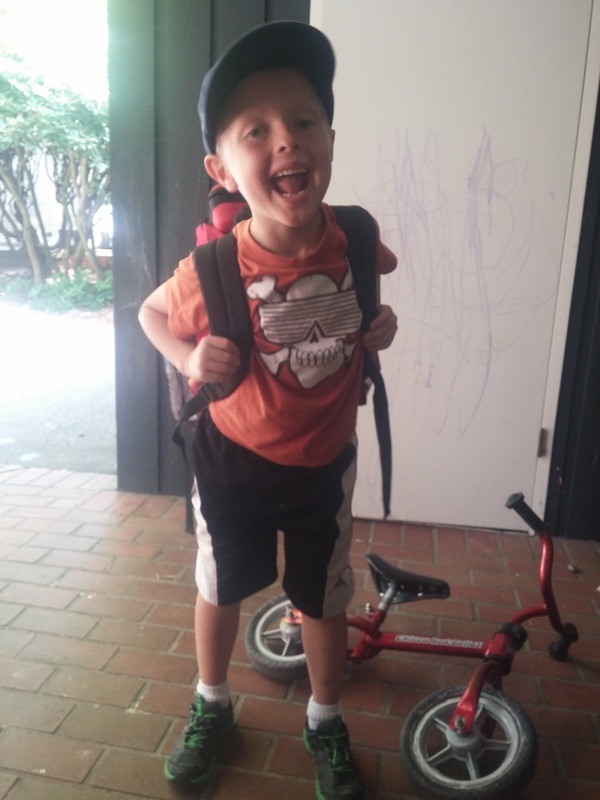 He uses his deepest, most authoritarian voice to say, "Dadow, mum! (come)" Sometimes Shadow even listens. She is very patient with Sammy continually eating her dog food and dumping out her water. 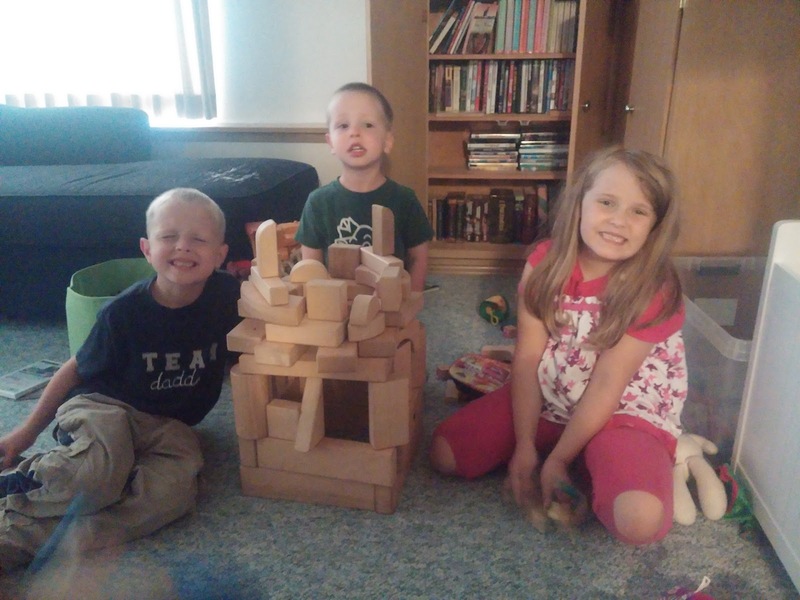 She doesn't seem to mind being Sammy's plaything. 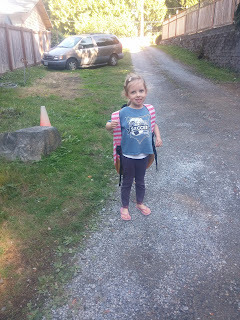 All of our neighbors went back to school after labor day, so we started easing our way back into a school schedule, too. We have been doing a lot of school with the Carvers. 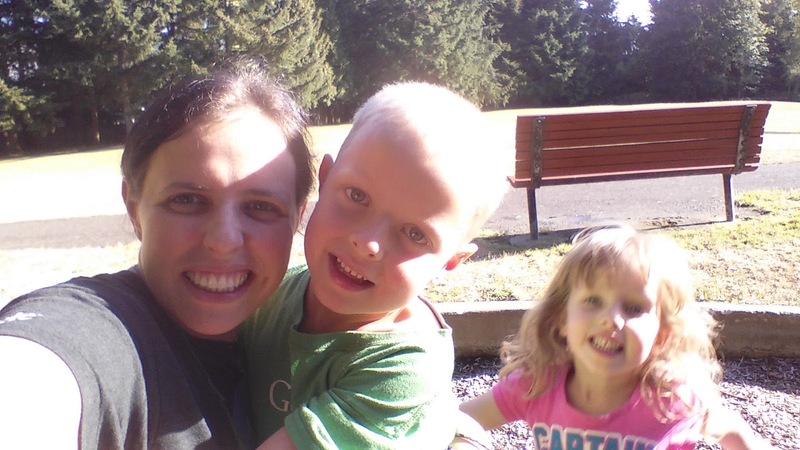 Sammy loves Dorothy, who he calls "Doh-ty," and lets her mother and manhandle him. School in nice weather often means we take it outside. 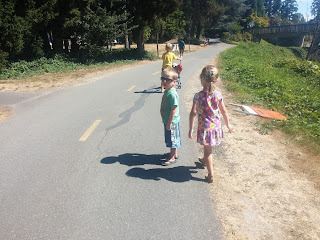 Minds learn better when bodies are active, so I don't mind very much that outside school sessions often devolve into bike races around the driveway. 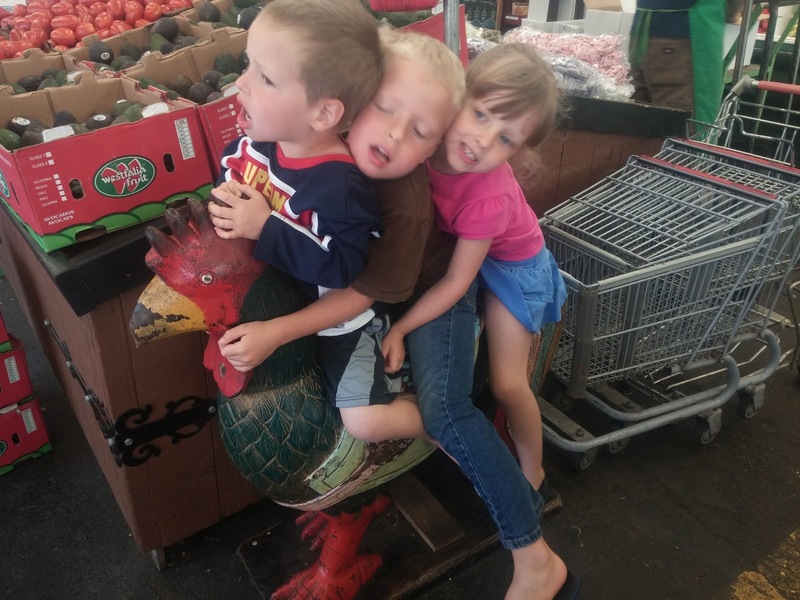 They only get one childhood. On September 13, Eloise had her first piano lesson with Jared's piano teacher, Sam. She was beyond excited. 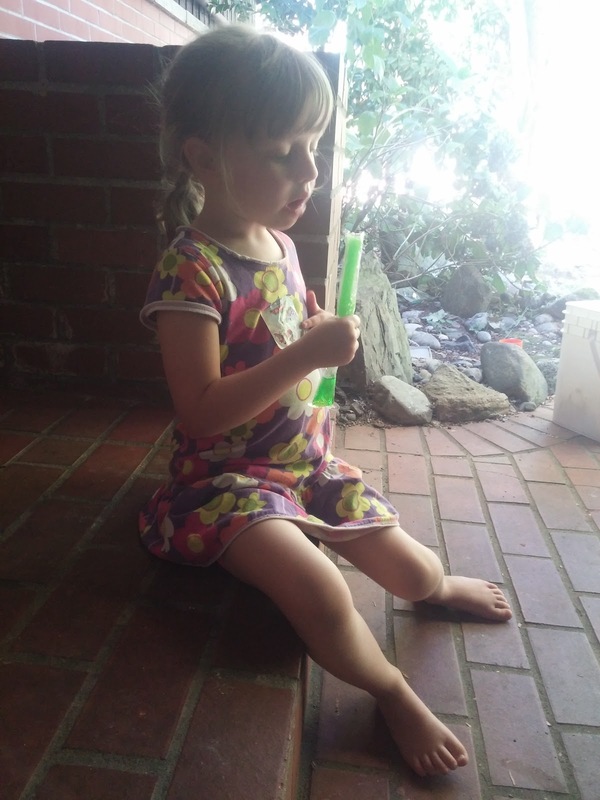 She spends at least an hour at the piano every day, practicing her assigned material, and then picking out tunes by ear, or playing the three pieces she has memorized ("Old MacDonald," "Mary had a Little Lamb," and "Ode to Joy.) Tuesday is piano lesson day, and she seems to glow with excitement when she is with the teacher. I hope this enthusiasm lasts. The week of Eloise's first piano lesson was also the week when we had a live, interactive broadcast with scientists aboard the Joides Resolution research ship. It was docked in Singapore when had our broadcast. 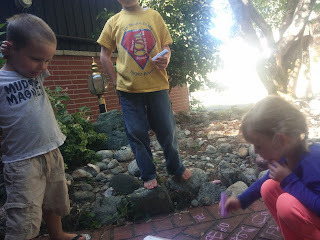 We opened it up to any of our home educated friends who were interested, and we ended up with 19 kids in our house to learn about the research they are doing in pulling up samples from the subduction zone of the tectonic plates in the Indian Ocean. It was pretty amazing. 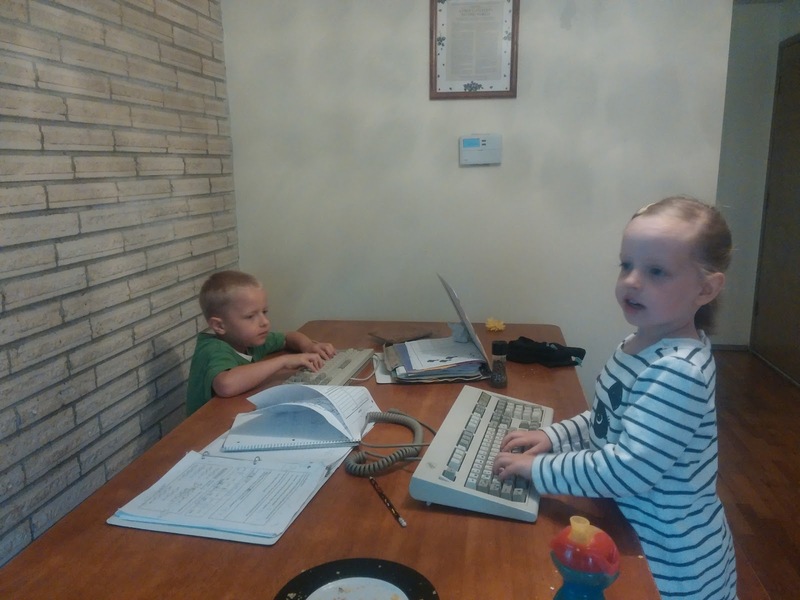 Jared and Eloise want to learn how to type, but they have a tendency to click around at random when they are turned loose on a computer, changing settings willy-nilly. Since I don't often have the time to supervise individual computer time, we do some of our keyboarding practice on these old keyboards Todd has collected (he has a thing for the old, clicky ones), which I color coded with a marker so they can learn which finger types each key. The temperature took a sudden nosedive a week before it was properly the end of summer. 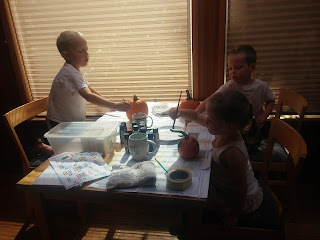 The Knight children who can read calendars were absolutely outraged that the weather was not cooperating with the autumnal equinox, until we went to the market for fruits and vegetables and they were each allowed to pick out a pie pumpkin. They insisted on painting them that very day. Cooler weather means the pace of our lives slows a very little bit, since we can't cram a park visit into every afternoon. 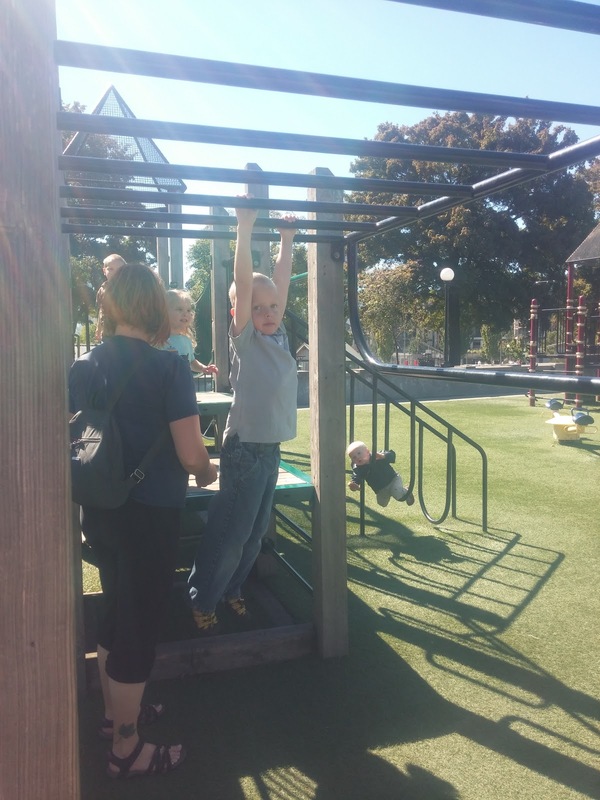 Between library trips, science classes, piano lessons, weekly field trips, neighborhood walks/bike rides, errands, play dates, chores, pretend play, and daily school work, our days and weeks slip away. We still manage to have an extraordinary amount of fun, though, even when the days are gray. 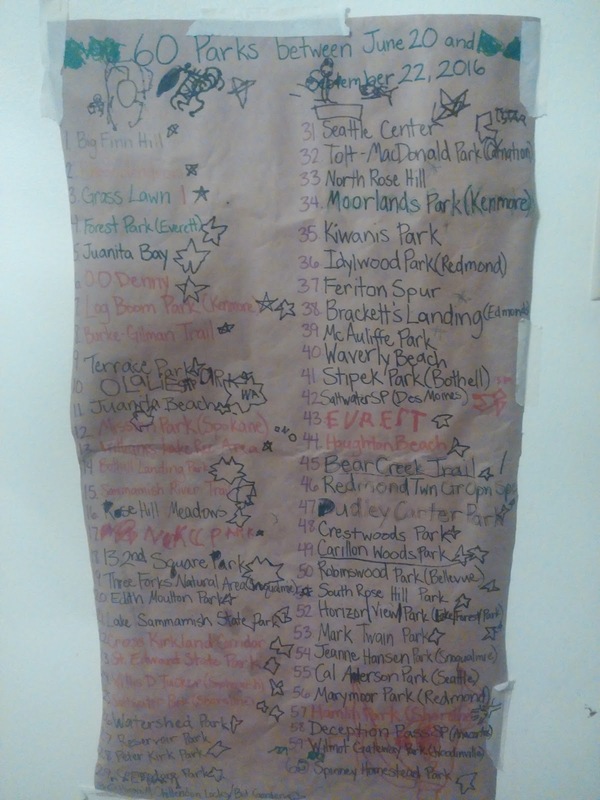 After Jared's birthday, we only had one month left to reach our summer goal of going to 60 different parks, and we had 15 parks left to go. 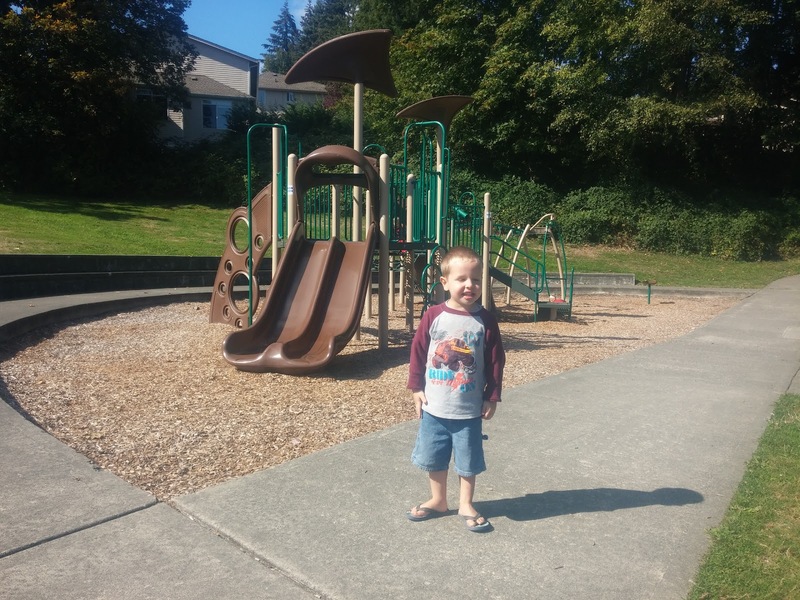 On August 25 we walked along the Sammamish River Trail through the Redmond Town Center Open Space and Dudley Carter Park (which was not much of a park) to have a picnic on the side of the trail. It was HOT. 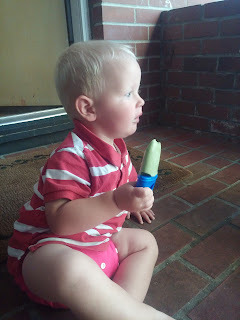 We had to go home and cool off with a popsicle. And a cool drink of water. 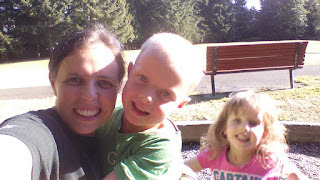 We took the weekend off from park going while Jared and Todd were on a backpacking adventure. 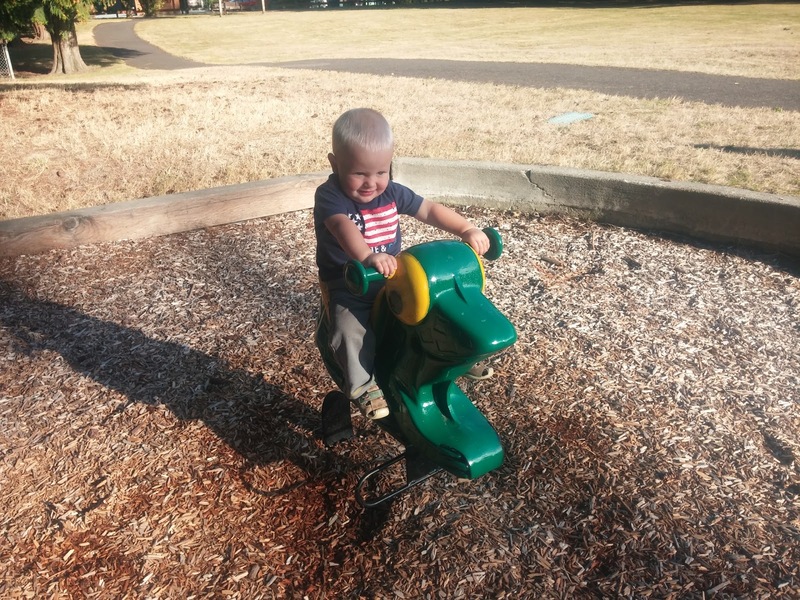 The weather cooled off a lot over the weekend. 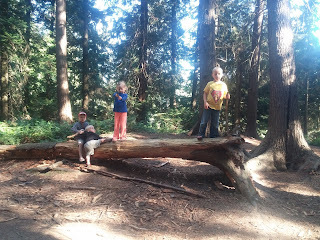 On August 30 we went to Crestwoods Park to pick blackberries and cheat death. Sammy scares me. 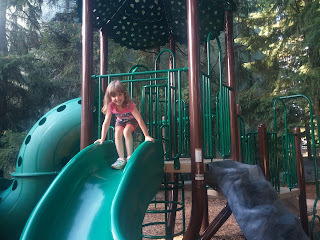 On August 31, we went to Carillon Woods Park. The playground there turned out to have almost the same design as the playground at Crestwoods Park. I was really sick for this park trip. I was run down and feeling terrible. This was one of two days when I just felt awful, and then all of my other symptoms cleared up, but my throat was an achy, throbbing, painful, swollen mess. I dragged myself to urgent care almost a week later and learned that I had strep throat. Of course I got this diagnosis one day before I was planning to run a half marathon, and so I couldn't do it. 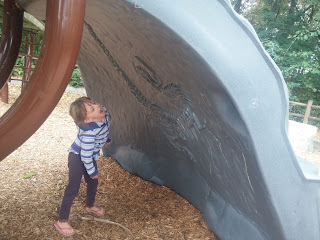 Eloise may be part dinosaur. She does a very accurate impression. We were goofing off at South Rose Hill Park on September 1, and I decided that climbing through these hoops would be a good idea. 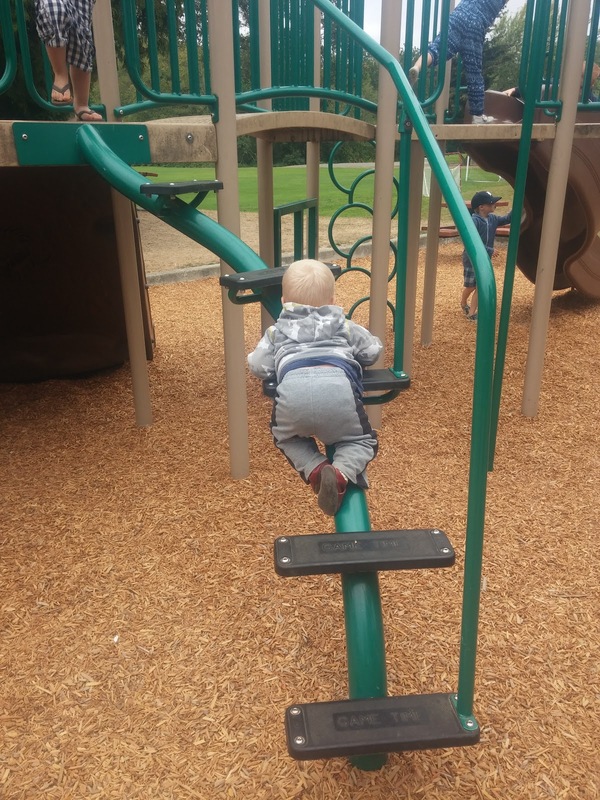 The uphill climb was easy, but I got stuck going down. 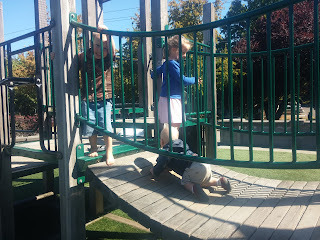 I was so funny that the kids had to get themselves stuck, too. Yes. We are all so hilarious. 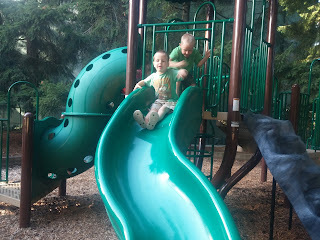 Fortunately, my humiliation occurred before the Christensens showed up to play with us, so I had a very small audience. On September 2 we met friends at the temple so that the moms could take turns doing temple work and watching children. 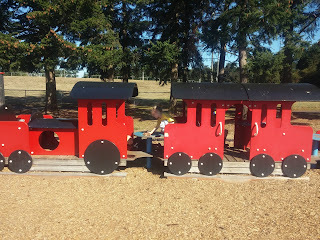 Next to the temple is a huge park called Robinswood Park where we went with the Carvers for lunch. Sammy was really excited about puddles, or, as he calls them, "Pubbles!" September 3 was a Saturday. 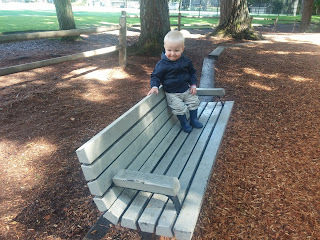 Daddy needed some peace and quiet in the afternoon, so we found a new park in Lake Forest Park called Horizon View Park. 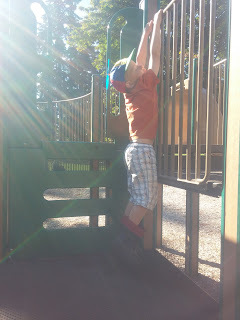 It was really busy, and we were surprised by the emergence of the sun, but we had a good time. Due to Labor day, starting school, and easing back into our routine after the long weekend, our next park visit wasn't until September 8. 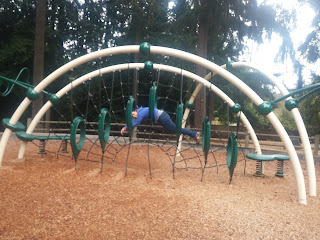 We went to Mark Twain Park in Kirkland, which had NO parking. 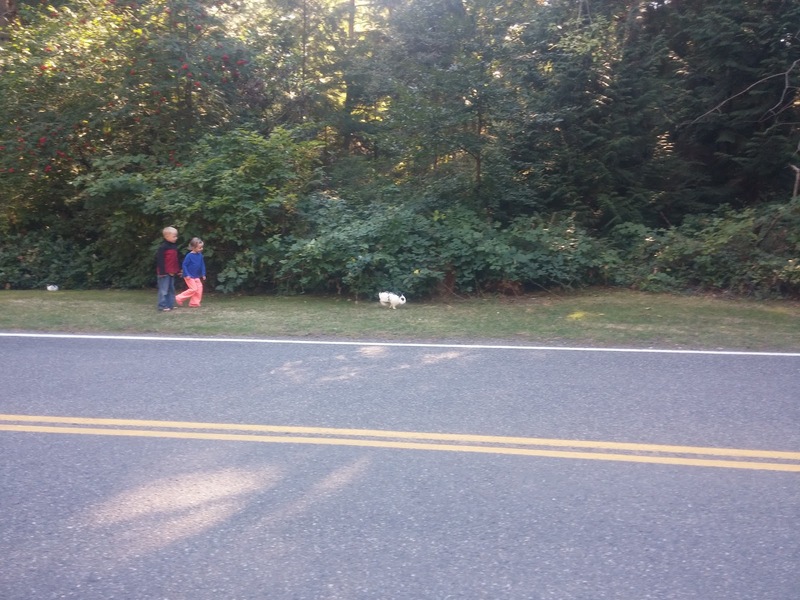 We drove around for ages before we found a friendly neighborhood street near a park entrance. 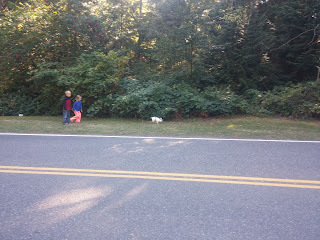 On September 10 we went to see our friends, the Wilsons' new house in Snoqualmie. At the end of their street is a park with two playgrounds, called Jeanne Hansen Park. Most of the pictures I took there were just terrible, thanks to the sun's bad placement, and the kids' energy after a 45 minute drive. 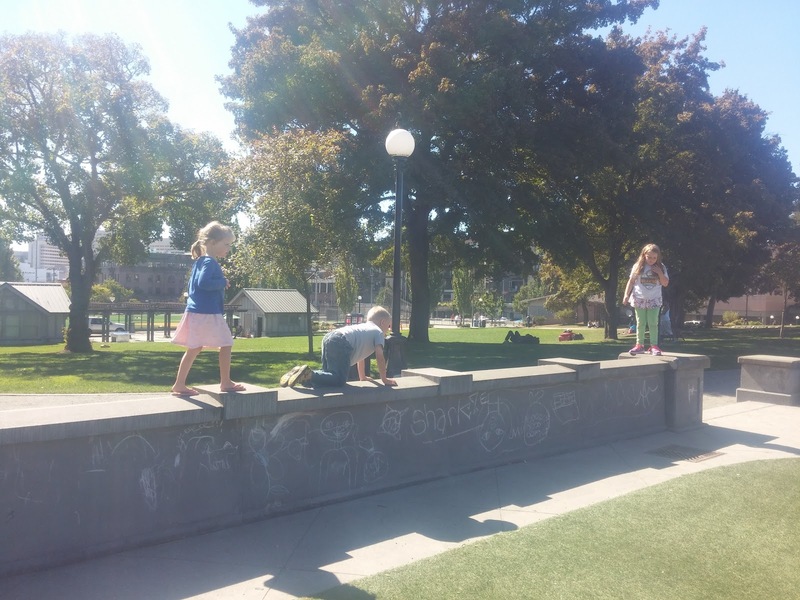 On September 12 we had a field trip to Seattle to visit the St. James Cathedral as part of our history study of the spread of Christianity through Europe. We went with the Carvers, who we are sharing classes with this year. I teach history to their two oldest girls, and Annie teaches science to Jared, Eloise, and (usually) B. 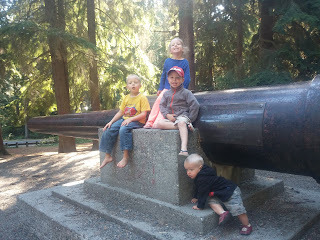 After the cathedral, we went to a nearby park called Cal Andersen Park. This turned out to be pretty seedy. The first thing that happened when we got there was the arrival of a troop of police officers on bicycles to remove a deranged old man from the children's play area. We had a picnic, played for a little while, and headed home. Annie later told me that the water feature that had looked so cool online, turned out to be closed to swimmers, smelly, and filthy. 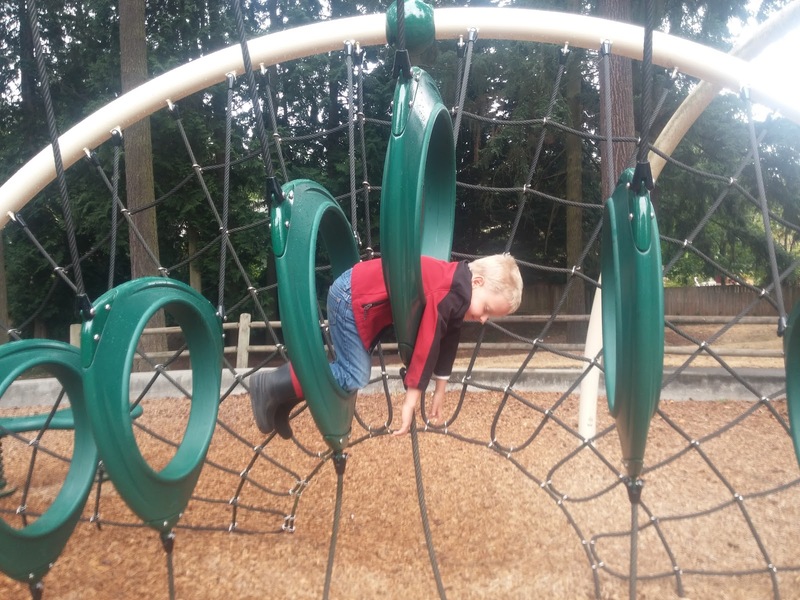 I love that Jared is testing his strength on the playground. 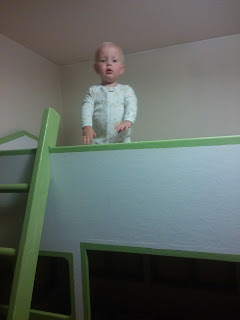 I love a little less that Sammy is testing his balance on everything he can possibly climb. 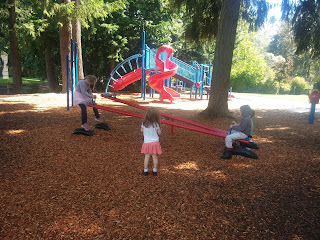 On September 13 we went to Marymoor Park. 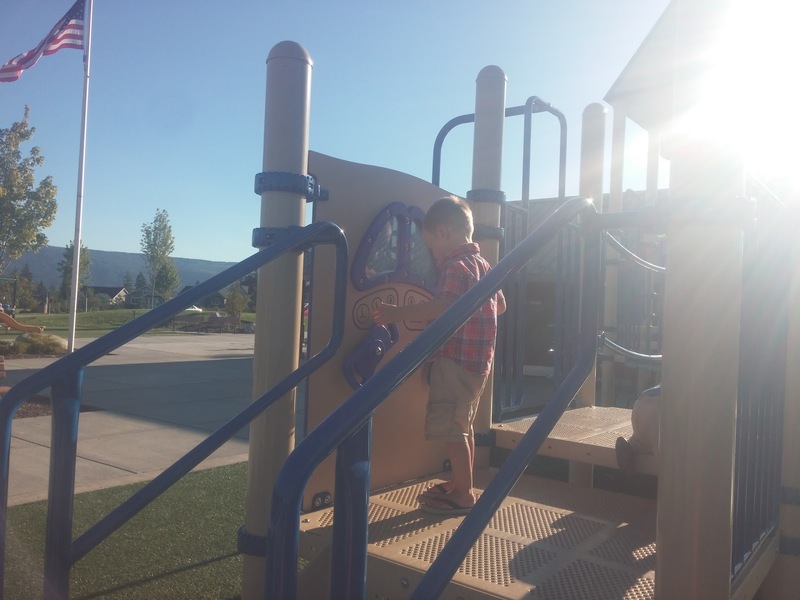 We went to two playgrounds, walked a mile between them, stayed until lunch time, and then B cried when we were heading back to the car, and he saw another playground that we hadn't played on, yet. My life satisfaction was pretty high this day, as the kids played joyfully together, and I walked the dog in circles around the play area. 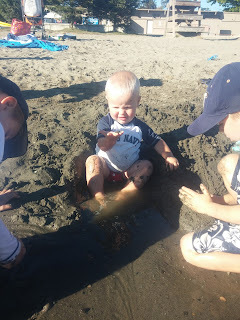 That same day we met the Christensens at Juanita Beach to play in the water. 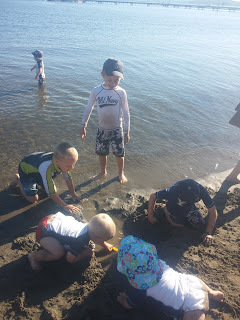 Our warm days were numbered, so we had to take advantage of one of our last possible water days. It was Baby Daniel's first time crawling around on the sand and engaging with the other boys at play. He ate a fair bit of sand, but he was so happy that we didn't have the heart to pick him up. 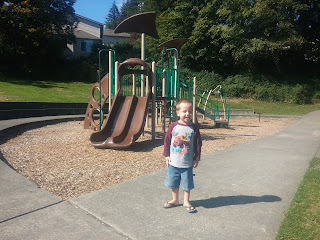 On September 15 we went to Hamlin Park in Shoreline. The first thing we saw was this bunny family. The adult ones were obviously someone's pets at some point. They let the kids get close enough to pet them. I stayed across the street with Shadow. 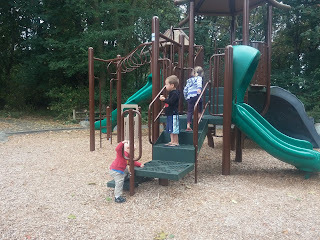 We went on a little explore in the woods before we played on the playground. 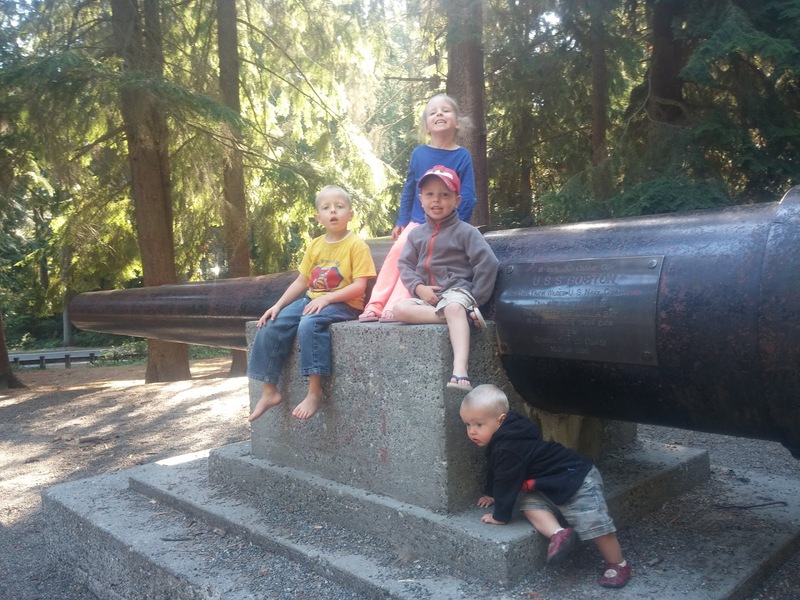 On September 16 we went to Deception Pass State Park. 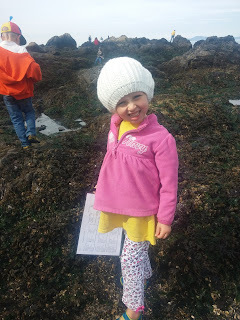 Two field trips in one week is a lot, but the Knight children really wanted Deception Pass on their parks list, and, when I consulted the tide schedule, the 16th had the most favorable tides for tide pool exploration (lowest tide was not in the middle of the night) of all of the days in the next week. We had to beat the September 21st deadline! It was cold there, as expected. We only had two major injuries, not counting the knee B skinned in the parking lot. Jared slipped and punctured his hand on the barnacles. He was very difficult to console, even though we had discussed the likelihood of barnacle injuries on the drive up. 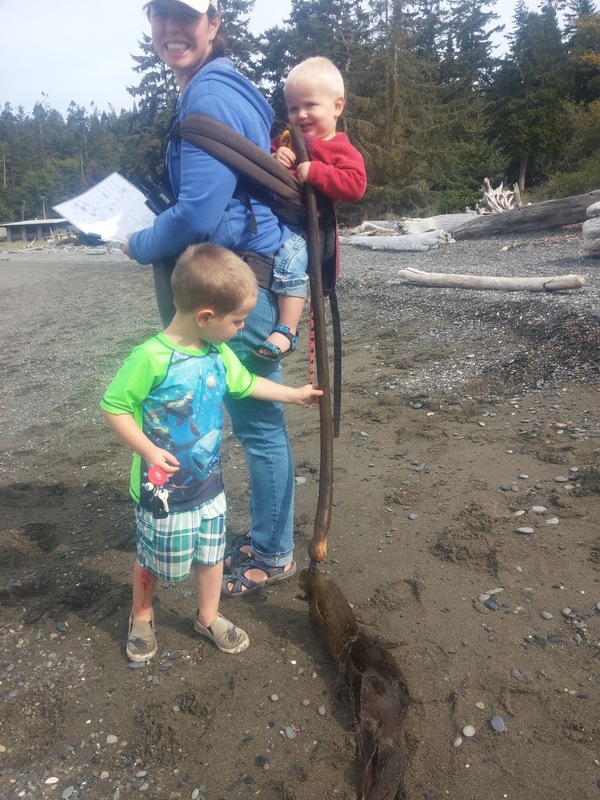 B skinned his other leg pretty badly when he was hanging onto the strap of my baby carrier without my knowledge, and I stepped over a big tidepool. 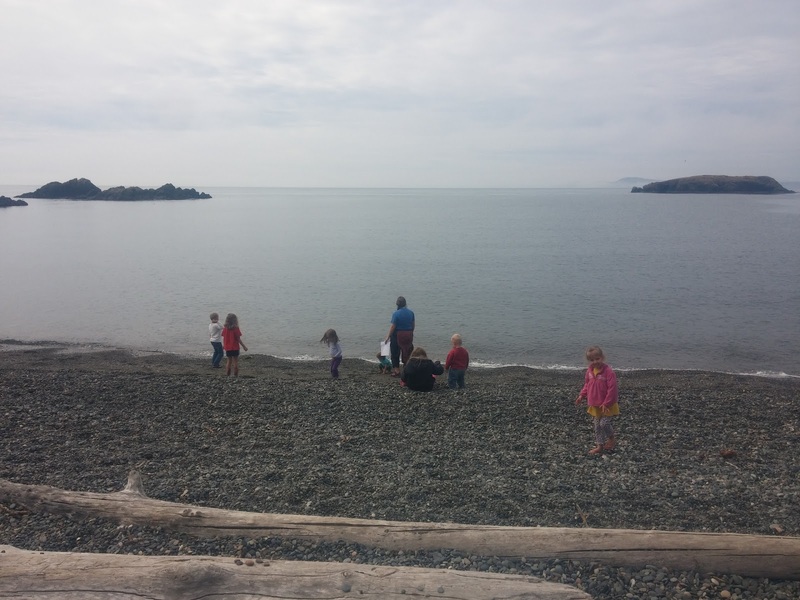 Instead of letting go, he hung on and got dragged across the rocks and through the water. 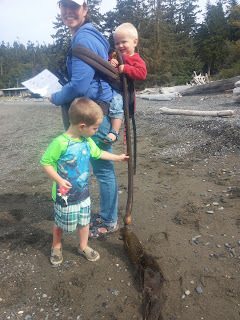 If you look closely at this picture of Sammy holding seaweed, you can see blood dripping down B's leg. We combined our science field trip with our history lesson for the week. 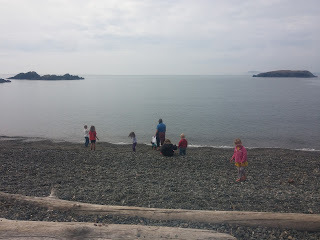 We climbed up the cliff to the picnic area for lunch, and then learned about the Byzantine Empire and made paper mosaics before coming back down to the water to look at jellyfish and throw rocks in. Jared told me to be sure to include my photo of his terrible injury. It was quite deep and icky. After Deception Pass we only had two parks to go! Of course I left my phone in the car at the 59th park, Wilmot Gateway Park in Woodinville, which turned out to be one of our favorite playgrounds, so no pictures there. 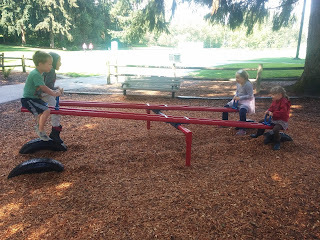 For our final park, I found a list of parks in the City of Kirkland, and discovered that we still have five parks with playgrounds, and probably around eight parks without playgrounds in Kirkland that we have not yet visited. We picked one at random and ended up at Spinney Homestead Park. 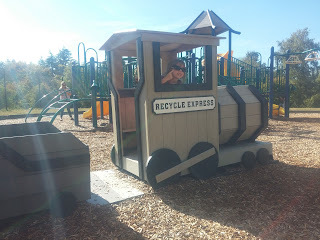 B declared this a winner, since he found an abandoned toy car here. Sammy, on the other hand, got stung by a wasp above his left ear, and cried all of the way home. 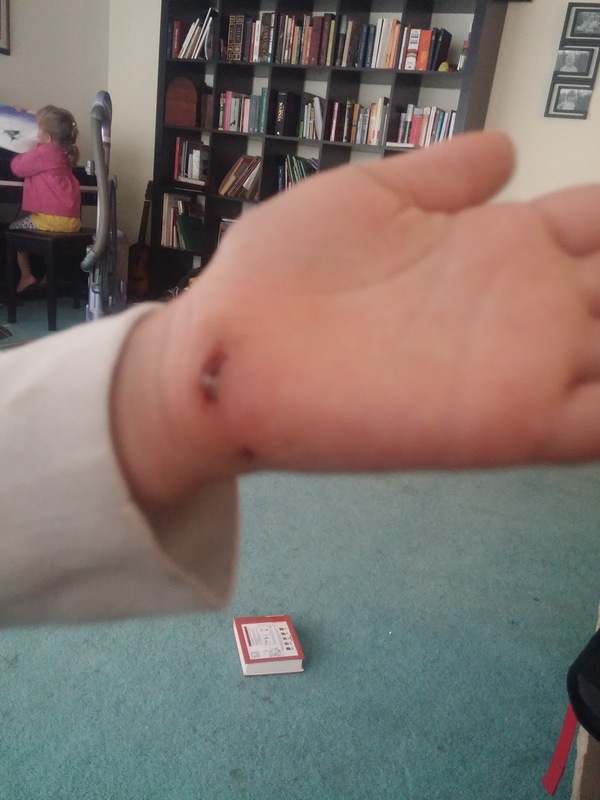 I didn't realize that it was a sting until the next day, when it swelled tremendously, and stayed swollen for three days. Poor Sammy. This was September 21, the last official day of summer. 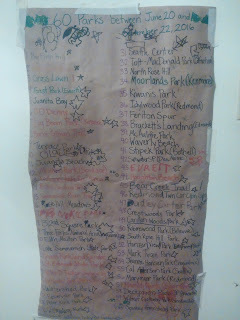 It was a fun, busy, active, memorable summer. I'm really glad that we set this goal, and I'm even more happy that we succeeded.